Air Force Brigadier General Jeremy (Java) Horn is obviously a man who likes to keep busy. His day job is commanding the two-thousand-and-some men and women in the three units that make up the Washington Air National Guard. But Horn also finds time to serve on the board of the King County chapter of the American Red Cross — the only military member on the board. In our interview, I ask the general if he sees his role on the board as putting the military in touch with the Red Cross or putting the Red Cross in touch with the military. His answer is a snappy “Yes.” And, in fact, both answers are correct, since there are historic ties that bind the nation’s armed forces with the American Red Cross. The American Red Cross was founded by Clara Barton, a battlefield nurse during the Civil War. A core function of the Red Cross is its Service to the Armed Forces (SAF), which provides emergency assistance to members of the military and their families. Horn, himself, turned to the Red Cross SAF program to bring home a son on duty in Korea after a death in the family. Further, says Horn, the Red Cross helps train the National Guard to carry out its role of lending assistance to the civil authorities in times of natural disasters. “Very often, the Guard and the Red Cross will respond to the same situations,” Horn says. “Red Cross disaster training helps our Airmen and Soldiers ensure they and their families are prepared for a crisis, so they can put on their uniforms and respond to our communities when needed.” The Red Cross also prepares Airmen, Soldiers, and families for extended separation through pre-and post-deployment workshops. For instance, both the Air National Guard and the Red Cross responded to some of the wildfires that hit Washington state last summer. Both the Guard and the Red Cross sent members to Puerto Rico and the Virgin Islands to assist victims of last year’s spate of devastating hurricanes. The Guard further supported post-hurricane search and rescue operations from Joint Base Lewis-McChord near Tacoma. General Horn recently got to see the international operations of the Red Cross close-up. The Washington National Guard has formal relationships with the military of both Malaysia and Thailand, and a joint exercise sent him to Malaysia. “I had some time in my schedule, so I met with leaders from the Pacific Region International Red Cross in Malaysia to discuss enhanced civil-military cooperation,” he says. Horn’s links to the Air Force go back a long way — to early in his childhood, in fact. ”I always knew I wanted to fly and the Air Force had a lot of airplanes,” he says. He grew up in Pensacola FL — a Navy town — but opted for the U.S. Air Force Academy when the time came to go to college. He first saw the Academy at age 10 when he visited grandparents who lived near Colorado Springs, where the service academy is located. “Once I saw the academy I was hooked,” he says. He graduated from the Air Force Academy in 1989. Since then he has flown A-10 Warthogs in combat, been a test pilot, an instructor and an Air Force liaison with Army units in the field. His nickname, by the way, comes from his heavy coffee consumption as a young lieutenant. General Horn himself has spent time as an Air Force officer embedded with an Army ranger unit. The timing is just right. The new Director of the Northwest Region’s Service to the Armed Forces Program, Scott Armstrong, a retired Army Colonel, has just taken the reins and is excited to enhance the Red WA ANG/Red Cross partnership to better serve airmen and their families. At the same time, Horn has been able to encourage some of his people to assist the Red Cross with its Sound the Alarm initiative — the major push to install smoke alarms in homes that don’t have them. 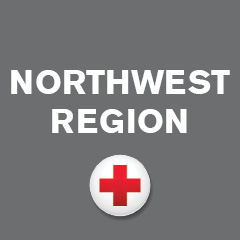 Looking ahead, it is a pretty safe bet Red Cross workers and men and women from the Washington Air National Guard will be working side-by-side at whatever natural disasters hit the region. It’s an equally safe bet that when disaster strikes, Java Horn will be helping to coordinate the response. Previous Knock-knock: It’s the Red Cross … no, really!